The fossilized space jockey seen in the horror classic Alien! Detailed diorama measures about 24-inches long x 18-inches tall! In scale with NECA's 7-inch figure line. Seen in the 1979 horror classic Alien, this impressive replica of the fossilized space jockey is a highly detailed reproduction in scale with NECA's 7-inch figure line, allowing you to recreate the world of the movie. Standing over 18-inches tall, this diorama element is made of hand-painted foam rubber and latex, and measures about 2-feet long. 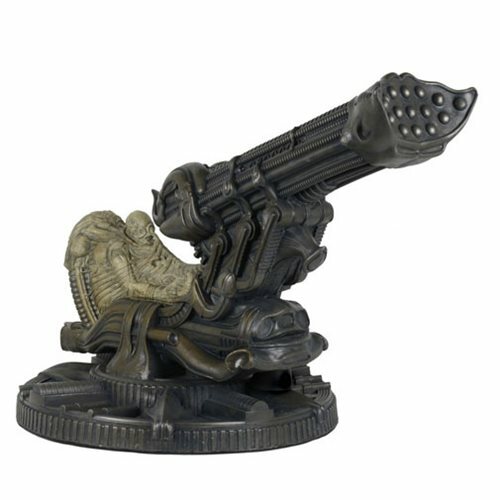 Expand your Alien universe with this Alien Fossilized Space Jockey Foam Replica that comes packaged in a reinforced corrugated box; no retail packaging. Figures sold separately. Ages 17 and up.